Today I went to visit the Museum of London, which is just round the corner from the Barbican. What I was actually there for was to see a bit of the BT Connected Earth collection, of which there was a small part there including a K2 phone box, a few old mobile phones and a line card from the UK’s first ever digital exchange to enter service, called the Empress (because it was installed at the Empress trunk exchange in London, having been developed by the GPO Dollis Hill research centre in the 1960s). VoIP is wonderful. Except when someone tries to DDoS your ISP and cause massive packet loss. The Web interface is largely similar to previous Snom models with a few extra features. However, I think they’ve got some bugs to fix on the 8.7.5.28 firmware because pushing certain buttons on the Web UI causes the wrong thing to happen, especially when you push red crosses to delete lists of missed calls etc. The really irritating thing is that the IPv6 support works, but I cannot understand for the life of me why on earth it will not resolve AAAA records. The only way I can get it to work is to put IPv6 address literals in instead! (And yes, I have reported the bug.) Once I did that, it connected to my IPv6-capable FreeSWITCH installation perfectly. What can I say about this phone? Well, it’s a Snom. If you’re used to previous versions of the Snoms it’s pretty much more of the same. However, they’ve got some stupid bugs to fix in the firmware but otherwise the phone works fine. Still no Opus support yet which is a shame. Also new (relative to the 370s) are Bluetooth and USB sound card support so you can plug in a USB headset, and multicolour (red/green/yellow) LEDs, unlike the 370 which only had yellow. Lots of possibilities with that, I’m sure once I’ve worked out how to control them. Dislikes: Firmware still full of stupid bugs, lack of Opus support, can’t resolve AAAA records. 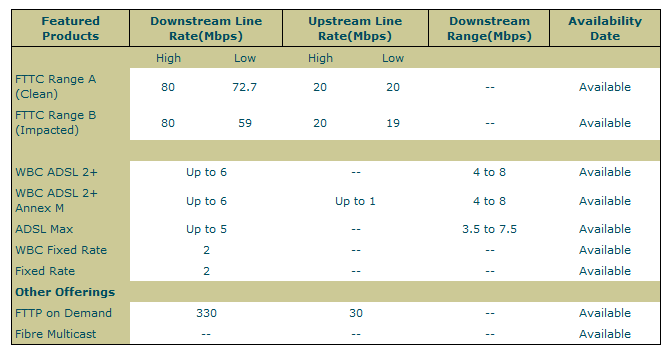 The advantage of FTTPoD over FTTC is that absolutely no copper is involved, so there’s none of this “up to” 80Mbit/s nonsense – although it’s not a guarantee, you get none of the disadvantages that using DSL brings, like interference and Christmas tree lights causing errors and slowing the connection down. Due to the way that GPON works, the downstream bandwidth is shared and split up to 32 ways, and the upstream bandwidth is effectively guaranteed since it uses time-based multiplexing to give everyone an equal share of the upstream bandwidth using time slots. So, in theory, although you could get less than the maximum bandwidth downstream, all 32 users would be having to max out their downstream links before that would happen. FTTPoD will eventually be available to everyone who is currently connected to a FTTC cabinet. This is because Openreach fit a so-called “Aggregation Node” (AN) in the road which the FTTC cabinet is connected to. The AN is effectively an optical junction box where the FTTPoD fibres are fed from the exchange, so for the installation fee you’ll get a fibre installed all the way from the AN to your premises, which will be connected to a fibre back to the exchange, so it really is entirely fibre from the exchange to your house, and it really does not go through the FTTC cabinet, as some people erroneously seem to believe. It is possible to fit an AN in the road and supply FTTPoD or FTTP without building an FTTC cabinet, so it’s possible this option may be offered in some places, perhaps in Exchange Only line (EO) areas where there is no cabinet between you and the exchange at all, but never the other way round – if you have FTTC already, you will be able to get FTTPoD eventually since the cabinet has to be connected to the AN. Openreach are rolling out FTTPoD slowly to FTTC-enabled areas, announcing groups of new exchanges quarterly, so not everyone is able to get it yet. The other catch is that MOUs (e.g. multiple occupancy offices) and MDUs (e.g. blocks of flats) are not eligible for FTTPoD, so those properties may well have to wait and see how the G.Fast trials go, which are supposed to provide up to 1Gbit/s over short runs of copper which are fibre-fed to a distribution point outside the property. The voice of the Speaking Clock in the UK for over 20 years, Brian Cobby, has died aged 83. Ofcom, the UK telecommunications regulator, announced last Thursday that for the 01202 (Bournemouth/Poole/Christchurch area) dialling code, callers from landlines will have to dial the full national number including the 01202 code, because Ofcom want to make local numbers available beginning with the D-digits 0 and 1 – for example, 01202 012345 and 01202 123456. (These numbers can’t be dialled without the 01202 first, since 0 and 1 have other meanings as the first digit). Although these numbers have been available for a long time as ‘National Dialling Only’ numbers, suitable for use as ‘hidden’ numbers possibly as the destination of a redirect, they haven’t been issued to your average member of the public in the UK before. It looks like this is all about to change, and means that an extra 200 DEF blocks (1,000 numbers) will be freed up to allocate to Communications Providers in the 01202 area, giving them a few more years before they run out of numbers. So I finally bit the bullet and decided to replace my T-Mobile G1 (HTC Dream) – the first ever production “consumer” Android phone with a newer model. I went in the end for the Sim-Free version of the Samsung Galaxy Nexus for several reasons – one, it’s a “Nexus” phone which means that Google tightly control the user experience and firmware, so there’s no unexpected surprises or manufacturer/operator add-ons in there. Compared to my previous phone, it’s certainly much lighter, and seems a lot more “flimsy” – but much of that is probably because it’s lighter. The screen size is far bigger than the old one, at 4.65″ diagonal and is one of Samsung’s Super AMOLED displays. Very nice quality screen, nice vibrant colours. One of the downsides of having a thin phone though is that there isn’t enough space for a “real” keyboard like the G1 had – personally, I found using the onscreen keyboard of the G1 a total nightmare because the combination of large fingers and too small a screen size meant that I ended up getting the wrong letters out most of the time. Thankfully with the Galaxy Nexus this isn’t the case, since the screen size is bigger and therefore more accommodating to my larger fingers. The phone has NFC (support for contactless smart cards, etc.) built in and does actually work (inasmuch as I proved that the NXP application could detect my Oyster card), which when the carriers/card companies/banks get their act together could be very useful. Battery life is also much improved compared to the G1 (which frankly isn’t hard). The phone comes with the brand-new Android 4.0 (Ice Cream Sandwich) operating system which is completely different in design but thankfully I had a go with it on the Android Emulator before I bought the phone so I knew exactly what to expect. A big downside of this phone is that there is no SD card slot, it just has 16GB of internal Flash memory. However there is a good reason for this, which is that most applications can’t be moved to an SD card slot anyway, so there’s limited use for it. I can cope with that, and the phone therefore isn’t able to work as a USB Mass Storage device, but can cope with the Microsoft MTP and PTP protocols so it appears as a Windows Portable Device, and you can use that to copy files to and from the phone. Camera is average (at 5 megapixels), but I’m not too worried about that since I don’t tend to use a mobile phone to take serious pictures anyway. Front camera is 1.3 megapixels. There are no physical buttons on the phone apart from the volume controls on the left, and the power button on the right – all the other buttons are ‘soft’ buttons and are part of the display. This seems a bit odd at first, but you soon get used to it. And the ITL41F firmware update rolled out to me yesterday to fix the so-called ‘Volume bug’, which probably wouldn’t have affected me much anyway since the mobile provider I use does not use 900MHz 2G, but I’m glad to see it fixed anyway. Another nice feature is that it does support (albeit in a limited way) 5GHz wireless networking, which means I can use it with the 802.11a standard (I don’t have an 802.11n capable access point). As this phone is a Nexus, unlocking the bootloader was a relative piece of cake – install the phone USB drivers, and put the phone into fastboot mode, then run “fastboot oem unlock” from the Android SDK software, and accept the ‘Do you really want to do this?’ message on the phone, and job done. It does however wipe your phone when you unlock the bootloader, but at least that means I now have the choice of any third-party firmware that I like once Google have stopped issuing updates to the official one. All in all, I’m very pleased with the phone, having had it less than a week. The only thing I’m really unhappy about is the fact I can’t get a suitable pouch case for it yet, but that’s only to expected with a newly-released phone. I can definitely recommend buying one if Android’s your thing and you’re looking for a no-nonsense Android phone. Some people may not like the “bare Android” experience though, and might be better suited to going for a phone with the extra bells and whistles put in. So, a good start. As far as I know, there is nothing left to do which will stop me making and receiving phone calls, so the switchover has been relatively painless. What’s left to do now is to find a way of doing all the fiddly but non-essential features that I can do as and when I’ve got time. Although the most urgent of these is to be able to change the outgoing caller ID to any one of my numbers, but hopefully that shouldn’t take too long to implement.